Wear and tear on iPhone chargers have been a common problem to users. They need to replace their cords, sometimes every 3 months, especially if they fail to take the necessary precautions in storing their chargers. In case you are one of those who have experienced the same problem, you might want to purchase wireless charging dock stands for your iPhone instead. These are sturdy so you do not have to spend a lot of money over and over again for pricier wired chargers. 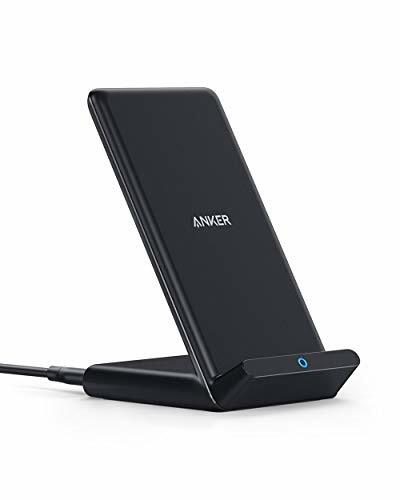 PowerWave Stand is Anker’s Qi-certified model of wireless charging technology boasting of high-efficiency anchored on chipset equipment currently being enjoyed by 30+ million users. It’s compatible to both Android and iPhone devices. It delivers 10W high-speed recharge to the Samsung Galaxy phone model and 5W for iPhones at 10% faster boosting time, proudly second to none. The charging function, while in use, is enabled to give convenience and prevents disruption of your tasks. Watching videos (landscape orientation) or messaging (portrait orientation) carry on hassle-free. If the phone is in a case, PowerWave penetrates without any trouble. Being case friendly, PowerWave transmits charging power directly through protective cases. Metal attachments or credit cards being the standard exception. It is not advisable to have metal attachments or credit cards near the phone device in order to optimize charging. Upon purchase, you receive a 3-feet Micro USB Cable, a welcome guide, and the assurance of an 18-month warranty backed with exceptional customer service. Note that no AC Adapter is included. Use your phone while charging wirelessly with this Qi Certified Fast Charge Wireless Charger Stand from Samsung! As everyone knows, Samsung is one of the trusted brands when it comes to Android Phones. It’s a good thing they came out with their own Fast Charging wireless charger for compatible Galaxy smartphones and other Qi-compatible devices such as the Apple iPhone 8, iPhone 8 Plus, and the iPhone X. It has a dual-coil design that gives a larger charging area, letting you power up your phone in portrait or landscape mode. This way, you can use your smartphone for video calling, widescreen viewing, and other functions even while it is docked. It is tested and certified by the Wireless Power Consortium. 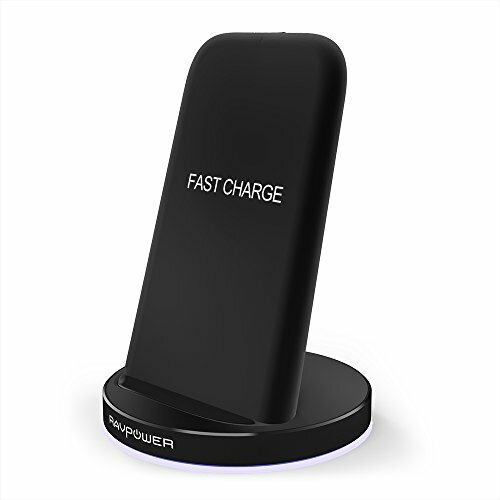 If you have a Samsung Fast Charge compatible device such as a Galaxy Note5 or Galaxy S6 Edge+, this wireless charger stand allows you to charge up to 1.8x faster than other wireless chargers. Standard charging speed applies to other Qi-enabled devices. Other features include multi-colored LED Glow lights to indicate charging status and a built-in cooling fan to keep both the charger and your phone from overheating. The retail package includes Wireless Charging Stand 2018 Edition, fast charge wall charger, Quick Start Guide, and a standard warranty. 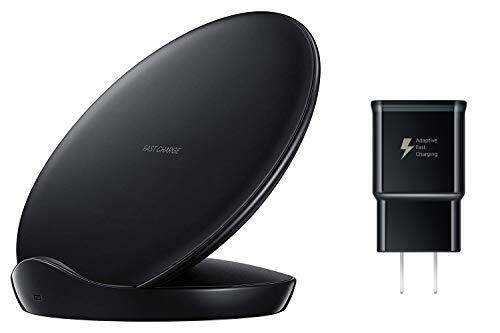 One of the top-notch wireless charging dock stands available today is the Samsung Fast Charge Wireless Charger Duo. It functions on Qi compatible smartphones such as the Samsung Galaxy S9, Samsung Galaxy Note9, iPhone X, Apple iPhone X, Apple iPhone 8, etc. With this wireless charger duo, you will no longer experience issues like lost cords or the struggles to find the appropriate charger for the device. Sounds great, right? With just a single outlet, you can have your two phones charged at once! You can also use pad charging for your iPhone XS Max or even the other versions of Samsung smartwatches. Charging capacity is the standard 5 watts to some devices like Galaxy S6 and Galaxy S6 edge. However, such results may vary. These are all laboratory tested by the Wireless Power Consortium. This Samsung Wireless Charger Duo comes with two coils for more convenient positioning in portrait or landscape model. Aside from the LED Indicator Lights that signal the charging status, it also comes with a cooling fan, built-in to keep your device cool while charging. It has Fast Charging Wall Charger with USB-C Cable as required to operate efficiently. Product size specs are 8.5 x 3.5 x 3.75 inches. 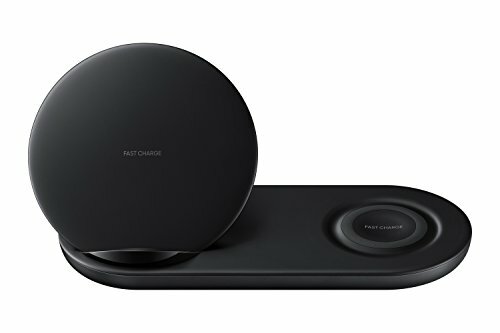 Samsung Wireless Charger Duo set (US Version) is accompanied by a Quick Start Guide and 1 Year Product Warranty. Yootech Wireless Chargers have 3 charging modes: the 10-watt fast wireless charging mode for Samsung phones (including S9, S8, S8 Plus, S7 Edge, S7, S6 Edge Plus, Note 5 phones), the 7.5-Watt quick charging mode for Apple phones (including iPhone X, iPhone 8, iPhone 8 Plus), and the 5-Watt mode for all other Qi-enabled devices. A 9V, 1.67A adapter will have to be used for fast-charging modes (10W and 7.5W) and a 5V 2A adapter for 5V standard modes. 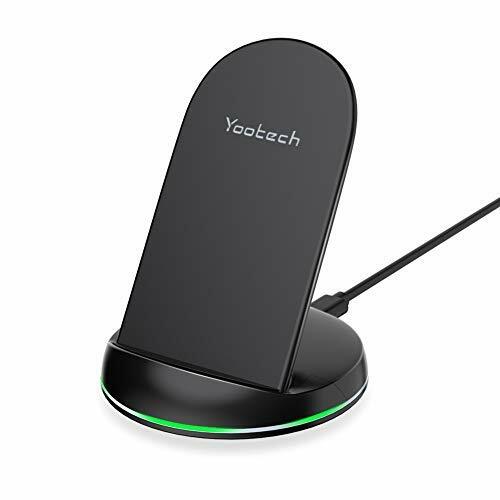 Yootech Wireless Chargers, known to be one of the best wireless charging dock stands, have a wide charging area, with two coils that allow for vertical and horizontal charging. Each device has intelligent temperature protection; it automatically stops charging when full and protects your phone from overcharging and overheating. It works well with rubber, plastic, TPU, PC, and PP phone cases of up to 4mm thick but not with magnetic, iron, metallic, or wallet phone cases. Your phones can also be used while charging, as the charger also serves as a phone stand for handsfree usage of your device. This one of the most coveted wireless charging dock stands is 3.6 x 3.6 x 4.3 inches in size and 5.3 ounces in weight. Each package includes a wireless charger stand, a 1 by 3.3 feet micro USB cable, a user manual, and a lifetime money-back guarantee. Customer service response is provided within 12 hours. 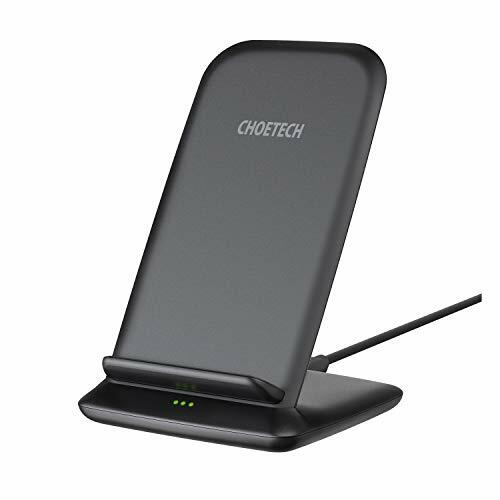 Choetech Wireless Chargers are compatible for iPhone, Samsung, and other Qi-enabled phones, making it one of the must-have wireless charging dock stands in the market today. The 10-watt wireless charger has fast charging capabilities for Samsung Galaxy S9, S9 Plus, S8, S8 Plus, Note 9, Note 8, S7, S7 Edge, and S6 Edge+ phones. The 7.5-watt quick charger is for iPhone X, XS, XS Max, XR, 8, and 8 Plus. The 5-Watt Standard Charger is for Samsung S6, S6 Plus, Huawei Mate 20 Pro, and 20 RS and other Qi-enabled devices. The Choetech chargers guarantee more stable and firmer charging through its aerodynamic design and anti-slip rubber mat. The wireless charging dock stand is 3.2 x 3.2 x 2.5 inches in size and 4.2 ounces in weight. It has a safe charging technology that protects the phone from over-current, over-temperature, over-voltage, and short circuit protection. It has 2 built-in coils to provide a wider charging area that can be used either vertically or horizontally. The device also serves as a kickstand to enable handsfree use and versatile viewing of your phone. Your phone can be charged with the case on, but for safe and effective charging, any metal objects (like metal rings or cards with chips) will have to be removed from the case. Package includes a fast-wireless charging stand, a 3 by 3 feet micro USB cable, a user manual and 18-month warranty. 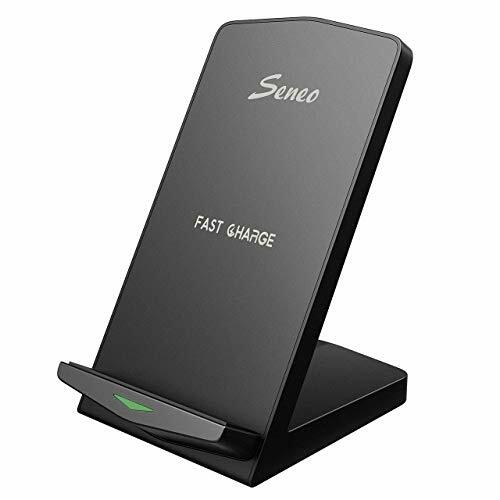 Seneo Wavestand is a Qi, CE, FCC, ID and UL-certified wireless charger that comes in 3 charging speeds: 10 watts for Samsung Devices (S9, S9+, S8, S8+, Note 9, 8 and 5, S7, S7 Edge, and S6 Edge+), 7 watts for Apple Devices (iPhone Xs, Xs Max, XR, X, 8 and 8 Plus), and 5 watts for all other Qi-enabled phones. It has an exclusive automatic temperature balance (ATB) technology that allows for faster wireless charging at lower temperatures. The ventilation holes on top of the device also allow better heat dissipation. Its temperature protection protects it from overcharging, overvoltage, and short-circuits, making it safe to use for your mobile phones. It has an intelligent LED indicator charging light that adjusts to being slightly dimmer in the dark to avoid disturbance of sleep and flashes to signal that the phone is not charging well. Seneo Wavestand can also be a 60-degree phone holder to allow ideal viewing while watching movies or reading books. The phone can be positioned vertically and horizontally and can be charged while being used. This charger is 4.7 by 3 by 3.5 inches in size and 6.9 ounces in weight. It uses a USB cord and a QC 3.0 adapter for outlet charging. Phones can be detected and charged so long as the case is less than 5 mm thick. Metal rings, metal cases, and credit card insertions will have to be removed from the device prior to charging. 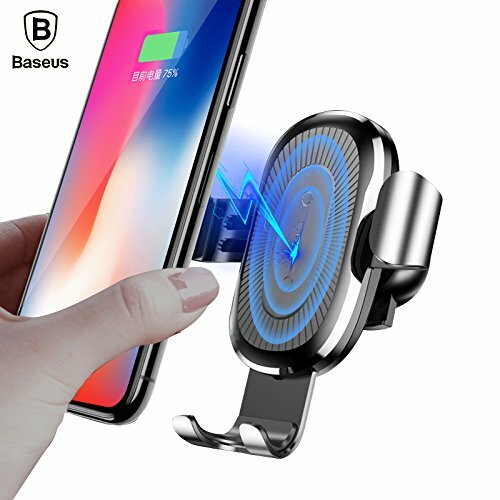 Baseus Wireless Chargers have 10-watt charging speeds compatible with Samsung Galaxy S8, S7, S7 Edge, S6, S6 Edge, and Note 8 devices and have 5-watt charging speeds compatible with iPhone X, 8, and 8 plus devices. They also work for other Qi devices like Nokia 9 and Nexus 5 and 6. This device has a trickle charging capability that automatically turns on when the phone’s battery percentage is at 95% to protect the battery and prolong its life. Its built-in smart chip also helps by protecting your Qi-compatible device from overcurrent and overvoltage. The charger works even with the phone case on, as long as the case is only 4 mm thick or less. Aside from wireless charging, this Baseus accessory also serves as a car mount and an air vent phone holder. Therefore, the phone can be charged and used as a GPS navigation device while driving. Your phone can be fixed into the mount with one hand by simply slipping your phone into the holder. To ensure that it’s secured, the phone has to be fixed into the bottom bracket. Baseus Wireless Charges have a 30-day unconditional refund policy with an 18-month manufacturer guarantee and customer service. Best Thing wireless chargers come in 10 watts (for Samsung Galaxy S8, S8+, S9, S9+, and Note 8 devices) and 7 watts (for iPhone XS Max, XR, X, 8 and 8 Plus devices) charging speeds. Aside from being a wireless charger, it can also serve as a fast car mount and an air vent phone holder. This means that your phone can be connected to the charger while driving and can easily be used for GPS navigation at the same time. Its bracket’s gravity and linkage design allow a more stable and secure lock to ensure that your phone won’t fall off the mount. The button on the charger also allows height adjustment so it can fit any of the mentioned devices above. Therefore, you can use one charger for multiple devices. This charger is 150G in weight, 11 by 10.5 by 4.5 cm in size, has a power conversion of 83%, and uses 110-205 kilohertz frequency. It is case-friendly and can detect phones with cases up to 8mm thick. It is black and silver in color. 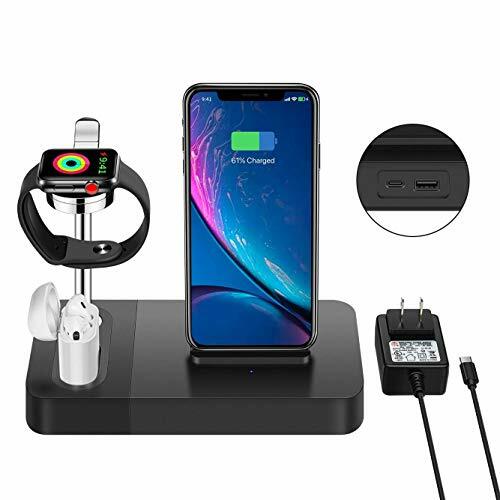 If you have chosen this among the other wireless charging dock stands, it comes with a micro USB cable, user manual, air vent mount, and wireless charger. Note that phone cases with metal linings, metals or magnetic objects will have to be removed prior to charging. The RAVPower 2 Coils Wireless Charging Stand is designed for super-fast charging of up to 10W to Qi-enabled and as well as for quick charge devices. This wireless charging stand offers wide compatibility of various devices. However, take note that there are some mobile phone models may require an adapter with the QC protocol. The RAVPower technology is expertly designed for faster and safer Qi charging which prevents overheating, overpowering and over-voltage issues. The charging stand is also designed to protect the device from short circuit, giving users the peace of mind when they are charging. RAVPower offers the best solution for faster and safer mobile charging with their functional design which allows devices to be charged either vertically or horizontally. It is now easier and more convenient to multi-task even when the mobile phone is powering up. Continue streaming movies on your mobile phone or even play games while charging the device. Another notable feature of the device is the anti-slip silicone rim for better stability and the anti-slip rubberized raised base which gives the device ample support and will keep it in place when charging. Users will be able to determine the charging status of their device with the discreet LED indicator at the bottom. The MQOUNY 3 in 1 Wireless Charging Stand is designed with efficiency and functionality in mind. This tidy and sleek charging stand can power up 3 devices at the same time such as iPhone, Apple Watch and Airpods. 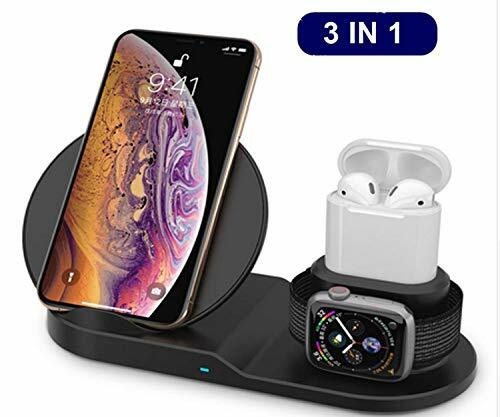 The modern and functional design of the 3 in 1 wireless charging stand can hold the Apple Watch, Airpods and mobile device securely even with just one charging cable under the base of the device. The no-fuss and polished design of the MQOUNY 3 in 1 Wireless Charging Stand can blend effortlessly with any room theme or style. The wireless charging device is also compatible with other mobile phone brands such as Samsung, Yota Phone 2, Nokia and Google Nexus. Do take note that some iPhone models may need additional Qi receiver for the wireless charging to work. This quick charging device saves you time and gives you peace of mind with the Temperature Control feature. Since the charger is made up of ABS environment-friendly materials that are cohesively structured to stop the charging process when the temperature of the device gets too high. Say goodbye to worries of overheating the charging device or your gadgets with the MQOUNY 3 in 1 Wireless Charging Stand. Olahtek brings you a multifunction wireless charger dock which is designed to allow users to charge their phones either horizontally or vertically. This particular feature allows users to multitask even when their device is still charging. It is now easier and more convenient to charge your iPhones and watch movies or take selfies all at the same time. 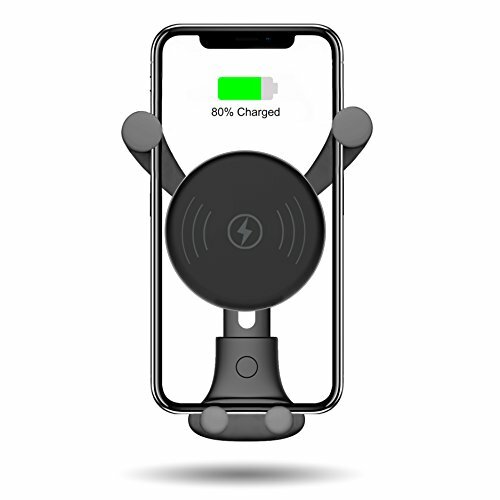 The Olahtek wireless charging is built to be compatible with a multitude of wireless charging devices not limited to iPhones but there are models that may need an additional Qi receiver. The Olahtek Multi-Function 7.5 W Wireless Charger Dock also comes with a dedicated AC adapter with UL certification which provides a more stable and secured charging. The AC adapter is designed to prevent the power supply from squeaking which will ultimately prolong the life of the device giving users a great value for their purchase. The wireless charger dock allows up to 3 devices to simultaneously charge such as iPhone, Apple Watch and Airpods. The charging base comes with a modern sleek design which also adds to the aesthetic value. The Apple watch charging stand is made of high-quality zinc alloy and as well as ABS material finished with a unique ornamental style. Power up your iPhones and Apple watches with the Beacoo 2 in 1 Wireless Charger and Charging Stand. The wireless charger is designed with a height adjustable charging board and with double charging coils which can speed up the charging process. The Beacoo 2 in 1 Wireless Charger and Charging Stand can also align with the charging centers of some mobile phone devices wherein they can still be charged even when placed horizontally or vertically. The Beacoo 2 in 1 Wireless Charger and Charging Stand is composed of high-quality materials and is designed with a non-slip pad at the bottom of the device to improve the stability of the stand. Get the best visual angle even when your device is charging with the adjustable charging module. It is now easier to multitask, watch your favorite movies or even take selfies on your phone while it is charging. The wireless charging device is great for any Qi-enabled devices, not just the Apple products. But take note that there are several phone models that may require an additional Qi receiver for compatibility with the Beacoo Wireless Charger and Charging Stand. The device is also designed for all versions of the Apple watch and can also go on a Nightstand mode. The MQOUNY Multi-function Wireless Charger is designed with excellent craftsmanship and convenience in mind. Say goodbye to using different chargers for your devices since this Multi-function Wireless Charger can charge any Qi-enabled mobile phones such as iPhones, Samsung, Google Nexus, Yota Phone 2 and Nokia. Please note that there are some mobile devices which do not have a Qi wireless charger function which will not be compatible with the MQOUNY. This multi-functional wireless charger can charge your mobile devices, Apple watch, and Airpods all at the same time. The wireless charger is made up of ABS environment-friendly materials which spell durability and it is also designed for temperature control protection. MQOUNY Multi-function Wireless Charger’s temperature control will give you that peace of mind even when you are charging several devices all at once. The device is designed to stop charging the instant the temperature gets too high making wireless charging a lot safer. Charging your devices even at the same time is now easier and more convenient with the use of just one wireless charger from MQOUNY. The MQOUNY Multi-function Wireless Charger is not just an efficient and powerful charging station but it can also be used as a nightstand minus all the pesky cords. The 4 in 1 Charging Stand Wireless Charger for Apple is the best solution to your charging problems. The device is designed not just as a wireless charging pad for Apple devices such as iPhone 8/8 Plus/X/Xs/XR/X Max but it is also compatible with Samsung devices and all Qi-enabled mobile devices. 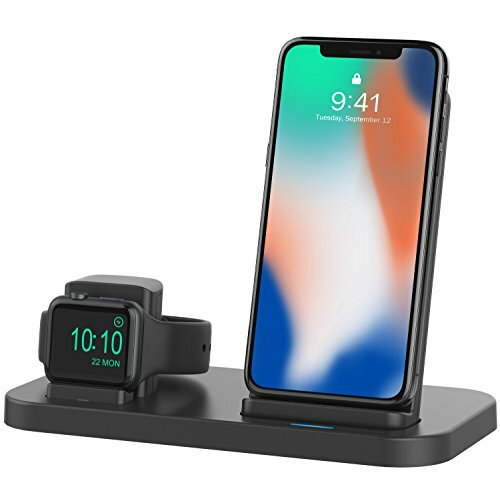 The charging stand dock also works as a watch stand for all versions of the Apple watch SERIES 4/3/2/1. The charging stand works well not just in iPhone models but also for the iPad Mini. The charging docks holder is designed for the Airpods and it can also be used as a holder for the Apple pencil. The 4 in 1 Charging Stand Wireless Charger for Apple will give you great value for your money and is definitely a must-have if you have multiple Apple devices or any Qi-enabled mobile phones. No need to buy separate charging docks or stands since you get all the functionalities in just one product. The device is expertly crafted with top quality ABS material for charging stand for your Apple watch. The Apple stand watch is designed perfectly for the magnetic charger for easy charging. The charging stand dock station for the Airpods is designed with elegance and stability in mind.